The Fourth Ward Cottage, originally located at 809 Robin Street in Houston’s Fourth Ward, was nearly lost to demolition in 2002. The nearby Freedmen’s Town National Register Historic District, which in 1984 contained 530 contributing structures, now contains fewer than 30 as development has soared in recent decades. The cottage was one of four adjacent historic houses relocated as a last resort in a joint effort between Historic Houston, Project Row Houses, and The Heritage Society. Because the area has experienced such significant loss of historic fabric, it was imperative to protect this significant example of the neighborhood’s vernacular homes and to use it as a public resource for the history of the Fourth Ward and its residents. It is now a City of Houston Protected Landmark (2007) and is one of The Heritage Society’s ten historic house museums. 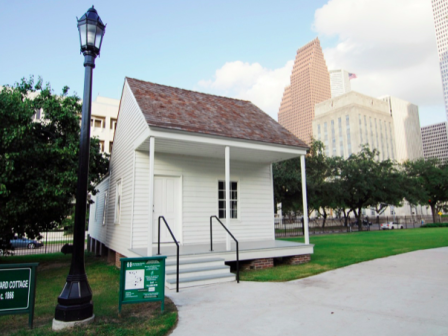 Ongoing research and documentation have further underscored the significance of the Fourth Ward Cottage, revealing that it is Houston’s earliest documented extant modest vernacular dwelling. Efforts have included HABS documentation, High Definition 3D Scanning, and paint analysis. Further materials analysis and archival research were completed by students and THS board members and staff. Originally a one-room cottage with similarities to the Acadian vernacular buildings of south Louisiana, the house was influenced by residents of many nationalities who played a role in Houston’s development: the Frenchman who surveyed the land, the Germans who most likely joined two separate structures to create the cottage we have today, the German and Italian families who owned it throughout its history, and the residents of various nationalities and races, including African Americans, who lived there. Exterior preservation work completed in 2013 provided needed stabilization and protection from the elements. A new cedar shingle roof was installed over existing wood sheathing. All exterior siding was removed, and existing framing was reinforced. Because of the poor condition of the existing siding, three façades were re-clad in sinker cypress milled to match the existing profile. The siding was installed over a moisture barrier and wood furring strips to allow ventilation of the exterior walls. The exterior was painted an off-white color informed by paint analysis. The front porch received new decking and front steps with an unobtrusive modern metal handrail. The Heritage Society is foregoing the traditional house museum model for interior interpretation of this building. Late 20th-century interior finishes have been removed to expose layers of earlier finishes and substrates below. These layers – including early wallpaper, evidence of a staircase, and several types of wall cladding – reveal the history of the building as it was modified by owners and tenants over more than a century. The walls remain untouched beyond light cleaning and stabilization of finishes. Supplemental information is provided through interpretive panels, currently in production, that will be placed in each room. These panels use timelines and images to explore the history of the neighborhood, the known owners and tenants, and the design and construction of the building. Character-defining features and evidence of changes are indicated via clues on handheld pages, leaving the walls free of labels and engaging visitors by allowing them to participate in the process of discovery. THS will continue the research process and update interpretive materials as we discover more in the future.